Latest Comment (June 8, 01:30 UT) : The DAY OF THE TRANSIT has begun - the Vt-2004 team is here to accompany you through this unique experience! Soon we will begin to display images of the Sun taken this morning by professional telescopes. This image taken 12 hours ago with the Swedish Solar Telescope (SST) on Tenerife (left) shows the so-called "granulation", cells of hot gas (hundreds of kilometres across) moving around near the visible "surface" of the Sun. 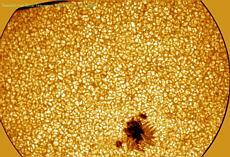 The dark feature in the lower part of that image is a "sunspot", a region somewhat cooler than the surroundings. 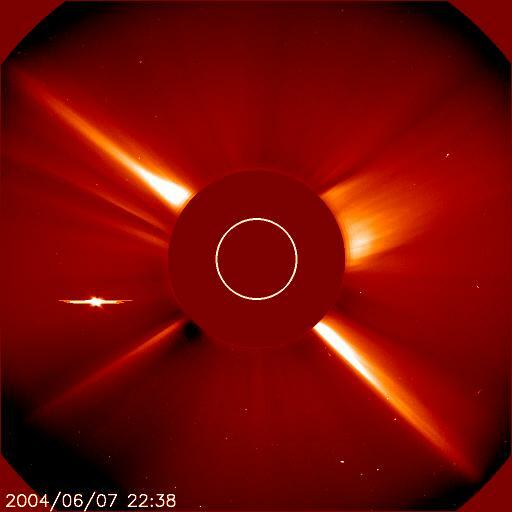 Venus is now very close to the Sun in the C2-image from SOHO-LASCO (right), approaching it from the left. 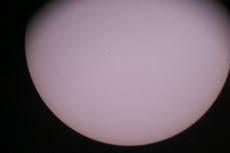 A test photo of the Sun (middle) was obtained by the ESO amateur astronomers (AGAPE) in the afternoon on June 7.